A Fabulous Day for a Run! We hope you enjoyed the 10th & final grand celebration of our 26.2 mile Marathon. Bringing it to a close was a painful decision. We appreciate your support over the last 10 years and your understanding. Five years ago we had 357 marathon finishers and 192 this year. I talked with many of you yesterday and we bonded over a moment or shared commiseration. Fewer people are running marathons these days, there are more races to choose from and from what I hear, other than those of us who live in the hilly rolling farmlands of Lancaster County (but not all of us) appreciate hills. As you can attest, we got a pretty good one right around mile 21. The short deceptive “bump” takes the wind out of your legs then goes up for another mile. Some of you are die hards, have run with us for years and we applaud you! For many it’s a once and done. Marathon runners – thank you for helping us celebrate the end of an era. Thank you to everyone who has run our marathon over the years! We’re runners at heart so we’re in no way abandoning the race! We’ll be focusing on a Half Marathon, adding a 10K and the Kids Marathon going forward. You can expect the same level of organization, support and Lancaster County hospitality. We think of it as a bunch of friends with a common love of running getting together for a weekend of fun and camaraderie. The relationship with the Bird-in-Hand Half continues so the highly coveted Road Apple Award lives on! You can still earn horse poop on a plaque by running the Garden Spot Half in the Spring and the Bird-in-Hand Half in the fall of the same calendar year. Every runner needs at least one of these awards! We will be here for you in the years ahead. What about yesterday? Was that an awesome day or what? It got hot but by my estimation you were the happiest bunch of runners we’ve had in the history of the race so far. You’re aware that registrations spiked after March 1st and we had to close registration because we only ordered so much stuff and feared we’d run out. Plus we advertised, no walk up registration, but so many walked up we finally made the offer that we would give people a bib, you would qualify for awards, would get an official time but no medal or shirts unless we had some left over and you we were thrilled. We were blown away. After the race yesterday I talked to a number of you who ran without bibs and carried your own water then bought food at the concession stand because you wanted to be a part of our running community and the festivities. We love our runners. You is such good people! The final finisher of our final 26.2 marathon, Betty Olmstead from Wilmington, finished in 8:02:30 and won first place in her age group, 70 – 74. I hope I’m still doing marathons at 72! Our Half Marathon overall winner this year was Jeremy Dovin from Narvon. As the story goes, after placing third in 2017 at the age of 13 with a 1:23:11 he was determined to win this year. He shaved 2:53 off last years time to finish First Overall with a 1:20:18! It was a pleasure to hand this young man that big 1st Place Trophy at the awards ceremony. He now holds the record for our youngest winner at the age of 14. A number of Garden Spot Village staff and residents ran this year as they do every year. Duane Tice a Garden Spot Village resident who began doing the half marathon in 2011 finished 2nd in the 70 – 74 age group with a 3:03:44. Don Aldrich placed 1st in the 70-74 age group with a 2:23:29. Don tells me he never really thought about running a half marathon until he moved to Garden Spot Village and Wellness Director, Lauren Graber encouraged him to give it a try. I gave him a thumbs up this past week when i was surveying the course and passed him on one of his training runs through the country side. Garden Spot Village is not only an amazing place to live, it’s becoming a runner’s paradise. If you’re 50+ you’re invited to visit and learn more. Ask for Kelly and tell her you run with us. She has been highly involved with the Marathon | Half Marathon | Kids Marathon and is a runner herself. I see people running around our campus and the surrounding area all the time. The weather has cooperated a number of times over the last 10 years and we’ve had some really nice days. Other times – not so much. We’ve had rainy days. Bitterly cold days. Windy days. The first year blessed us with gale force winds. Often the wind has a tendency to smack you in the chops when you make the turn for the final 2 miles back to campus after the Wallace Road water stop. We got a freak snow storm in 2016. That was a day to remember. Until yesterday the weather hasn’t permitted us to fly our hot air balloon. 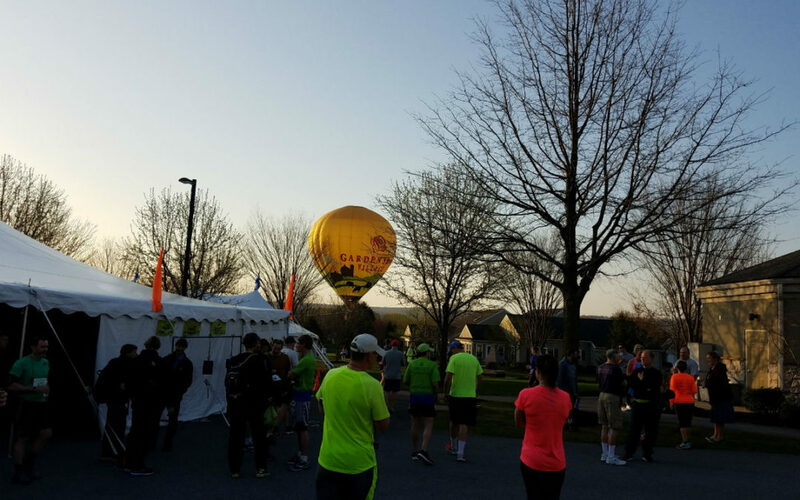 Featured in the photo, a handful of runners who wondered over for a closer look got a ride in the balloon. The hot air balloon was a first for the celebration of our 10th Annual event. Thank you to everyone who ran with us yesterday (officially and unofficially)! We hope you had a wonderful time, enjoyed the run and made some new friends. We certainly consider you friends. We hope that you will come run with us in the years ahead. We’ll be planning a new half route and adding a 10K. To get your kids, or grand kids interested in running there will be the Kids Marathon. Our goal will be to provide you with a new, exciting course and an extraordinary run and after-run experience. Volunteers – our thanks to all of you. There were just over 500 volunteers mostly residents of Garden Spot Village plus supporting local business, non-profits and civic groups especially at the water stops. With police, fire police and EMTs there were closer to 600 volunteers in total. That’s a bunch of support and we appreciate everyone of you! Thank you!! Thank you to our sponsors. Your financial support and contributions help make this event possible! Runners, you are the reason we do this. You are a dedicated, inspiring and down right good bunch of people. We love having you visit us for the weekend to do something that you love to do. We hope your life was enriched and that you will visit and run with us again.